Laurent Quignette aka "Bretzel Man" won the DECA ultra triathlon in Mexico 2017 – only a few weeks after his third place at the DECA in Switzerland. This year, he will start again at the swissultra. In the interview he reveals the secret behind his nickname, the worst experience at the DECA and his dream for 2019. 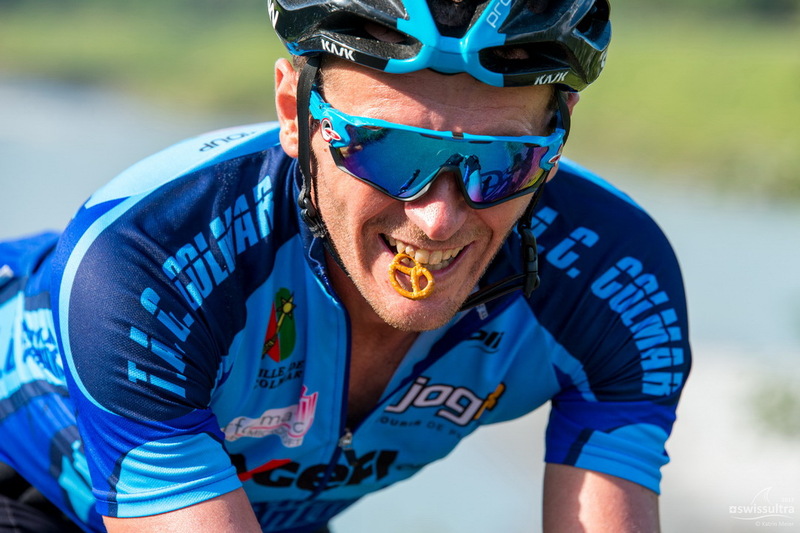 Laurent, you call yourself "Bretzel Man" – and the pretzels are everywhere: on your clothes, on your tent; you eat them on your bike and you even take an inflatable pretzel to the competition. Where does this passion for pretzels come from? I've always had a couple of pretzels in the pocket of my cycle jersey. One day a friend from my club created a logo called "Bretzel Man" - since then they call me so! Alsace, where I come from, is also known as "the country of pretzels". Last year you were third at swissultra - DECA Continuous, you won the DECA in Mexico and finished second in the IUTA World Cup. What are your goals for 2018? 2016 and above all 2017 were extraordinary years for me. In 2018, I would like to be on the podium at swissultra. And I want to win the World Cup – together with my team, the "BRETZEL TEAM"! Why did you register for the DECA Continuous in Switzerland again this year? In 2017, the swissultra was my first DECA. I liked the competition. I therefore decided to do the DECA in Mexico as well, less than two months later. I like the swissultra, the organization, the venue and the atmosphere in Switzerland. And Buchs is relatively close to Colmar – so my friends can visit me at the competition! How do you train for the DECA? Are there any key training? I train all year round – I do trail runs and ultra-trails, marathons, ski and bike, I go mountain biking and swimming, participate in triathlons ... For the DECA, I also plan eight major training blocks. Each of them includes at least 300 kilometers of cycling and 12 to 24 kilometers of running. Sometimes I also throttle the intensity and train with my friends. Do you train the same as for the DECA last year? The structure and frequency of the training is the same. Last year, my friend and ultra-triathlete Emmanuel Conraux advised me. And Guy Rossi helped me plan the DECA. On their advice, I intensified some trainings and renounced others to become more efficient. Ultratriathlon training is not an exact science – you need a lot of "feeling" for your own body. And experience is also an advantage! When did you start doing ultratriathlon races? I did my first triathlon in 2013. Before, I could not even swim! My coach Hugues Clauser brought me to triathlon and ultratriathlon. In the same year, I also switched from trail to ultra-trail races. My first ultratriathlon was the double in Slovenia, where I was welcomed by the winner Matej Markovic ... I have loved this sport from the very beginning and appreciate it as a very familiar. I adore it! What are your greatest achievements in ultratriathlon? Certainly, my victory at the DECA Mexico 2017! In 8 days and 20 hours, less than two months after my third place at the DECA in Switzerland ... In Florida, I once finished in 2nd place and once in 3rd place, and in Slovenia, I was also third. ... and Hugo, who brought me to ultratriatlon. Only later I met Guy Rossi, at the Double in Slovenia! We live only 300 meters apart ... Emmanuel, "Manu", is a good friend of mine. Then there is Dominique Bouvier, who has already finished a DECA. In the Alsace region, I was able to inspire even more athletes for ultratriathlon, for example Serge Mortz, Mathieu Hiltenbrand and my friend MANU from Chambéry. I do not know why so many ultra triathletes come from the region around Colmar – but the passion for this sport seems to be contagious! Which is your strongest discipline? First and foremost, I am a runner. I started playing tennis at the age of four and ran around wildly on the court – I was a fast runner. But never a swimmer: I learned crawling only five years ago. A competition as long as a DECA Continuous, which can take up to 14 days, is also a mental challenge. How do you manage not to give up? I do not tell all my secrets! But I have two frieds that are mentally very strong, Coach FX and Coach TOF. They showed me methods like self-hypnosis. Since my bicycle accident in 2016, the mental component has become more important for me. My osteopath Dominique also supports me, as does the rest of the BRETZEL team. At a DECA there are beautiful moments, but also painful ones ... do you remember? At DECA in Mexico I found it relatively exhausting to be in the lead all the time. That was stressful, but probably a unique experience! At swissultra I experienced the most beautiful as well as the most painful moments. When swimming I got an allergy to the chlorine water. The skin was open and bleeding in the area of scrotum and on the back of the knees! I suffered on the bike and had to change bandages every eight hours. I felt very bad. Despite the chlorine allergy, you have made a great race! Yes - at the marathon I realized that I could walk well and came very close to legends like Ferenc Szönyi and Dave Clamp! At this point I would like to thank four friends, who helped me after the swim and looked after me and nursed me back to health: Dominique, Fred, Maiwenn and Floriant. And all the friends who came and cheered me on, including Clément, Cyril, Gaetan and Eric. How do you feed yourself in the competition? Phuu, that's a big topic! In general, I switch between normal diet and gels. And I like pretzels and mashed potatoes as well as tuna sandwiches. Is it difficult to find sponsors for your competitions? Yes, that's not easy – ultratriathlon is still a niche sport. After swissultra 2017, I had a lot of support and money for traveling to Mexico in record time. This year, it’s more difficult to find sponsors; the economic situation in France is not so good. We have set up the website www.bretzelman.fr and now offer coaching and conferences to finance the season. I firmly believe that we can do it! And the last question: If you could wish - which competition would you like to do in 2019?